There was a time when Red Hot Chili Peppers were an exciting and inventive rock band. That time was very long ago. The days when this group was blending the influences of bands like The Police and Gang of Four with US punk and the burgeoning rap movement into an exciting and innovative sound have long since be replaced with the self-same blandness and vapidity they once stood in direct opposition to. 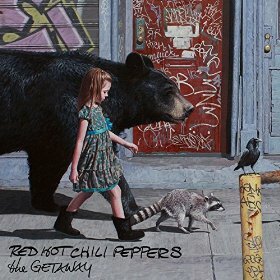 If the title is meant to indicate a reinvention, then they have succeeded: The Getaway is the Chilis’ most lacklustre album ever. Praise has been lavished on this album elsewhere for this new direction of laid back ambience, but in truth it really isn’t very interesting. It takes until track five before any kind of real variation in tempo or mood comes in, until ‘Go Robot’ before some semblance of their old funk-informed style shows itself. The punked-out funky jam ‘This Ticonderoga’ injects a breath of life into an otherwise limp album, but even this is only temporary. Never the most expressive of vocalists, Anthony Kiedis has rarely sounded less enthused and Flea does his usual Seinfeld-theme popping bass thing without extending himself. Josh Klinghoffer, however, stamps his authority throughout with his airy, spacey guitar playing, as if The Getaway was designed to accommodate his style, but it seems so out of place on a Red Hot Chili Peppers album. Lyrically, of course, this is nothing new – odes to California and general nonsense pervading, making even pensive tracks like ‘The Longest Wave’ seem less meaningful than they otherwise should. While there are some artistic flourishes, overall The Getaway is actually a pretty listless collection of songs. Ⓒ 2019 Loud Magazine Australia Website by Blue Mountains Websites.